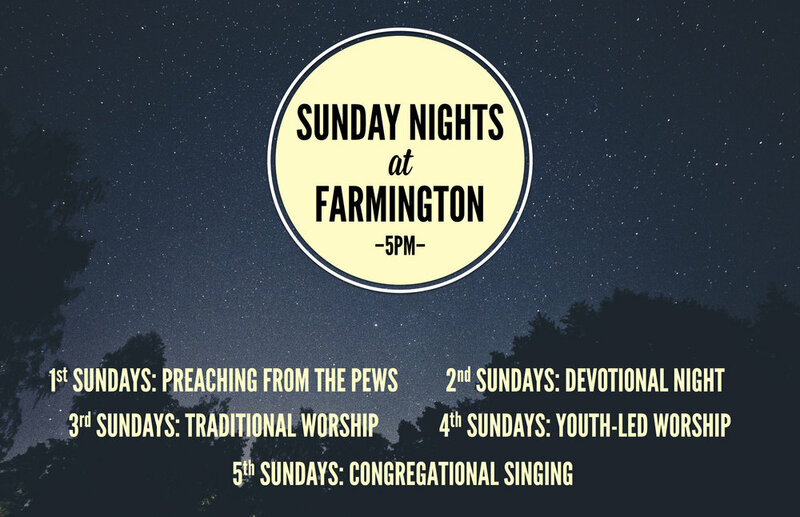 FIRST SUNDAY | Preaching From the Pews: At Farmington we are blessed with a number of men who are willing and capable preachers. On the first Sunday of each month, these men take turns delivering biblical messages. SECOND SUNDAY | Devotional Night: Our devotionals alternate between themed singing services, prayer services, and services dedicated to the public reading of Scripture. THIRD SUNDAY | Traditional Worship: These nights follow the same format as our Sunday mornings. FOURTH SUNDAY | Youth-Led Worship: On the fourth Sunday of the month, our young men lead the congregation as we worship. They lead songs, and prayers, read Scripture, deliver a Bible lesson, and preside over the Lord’s table. FIFTH SUNDAY | Congregational Singing: When a fifth Sunday occurs, our worship schedule operates on a Church-Eat-Church model, where following morning worship we have a fellowship meal followed immediately by a period of congregational singing. During this time, all of the men in our congregation are invited to pick out and lead a favorite song.